With the implementation of primary care networks (PCNs) across the province, the Ministry of Health is forming a new Primary and Community Care Policy Implementation Committee (PCCPIC) to oversee the various aspects of implementation of PCNs and an integrated system of primary and community care across the province. The committee will be established in September 2018 and stand until March 31, 2020. It may be renewed at that time, at the discretion of the Ministry of Health. The committee will be chaired by Ted Patterson, Assistant Deputy Minister, Ministry of Health, Primary and Community Care Policy Division (and GPSC co-chair), with David Byers, Assistant Deputy Minister/Chief Nurse Executive, Clinical Integration, Education and Regulation Division serving as vice-chair. One division of family practice physician representative from each of the five health regions (an additional five physicians would serve as alternates). Two Doctors of BC representatives (GPSC Co-chair Dr Shelley Ross and Dr Brenda Hefford, Executive Director, Community Practice, Quality and Integration). A health authority representative from each of the five Interdivisional Strategic Councils (ISCs). A First Nations Health Authority representative. A representative of the BC Nurse Practitioners Association. Additional participants may be invited to participate in the committee at the discretion of the Chair. Provincial oversight for the implementation of PCNs, including Urgent Primary Care Centres and Community Health Centres and alignment of the Complex Adult Medical and Mental Health and Substance Use Specialized Community Service Programs (SCSPs). Advice to the ISCs and Collaborative Services Committees (CSCs) to enable them to make informed regional and local decisions related to PCNs and SCSPs. Recommendations to the ministry on key issues related to allocation of funding to support the implementation of PCNs and SCSPs (this includes review of service plans, with the support of staff). The committee will also contribute advice to the GPSC on key issues related to PMH implementation. 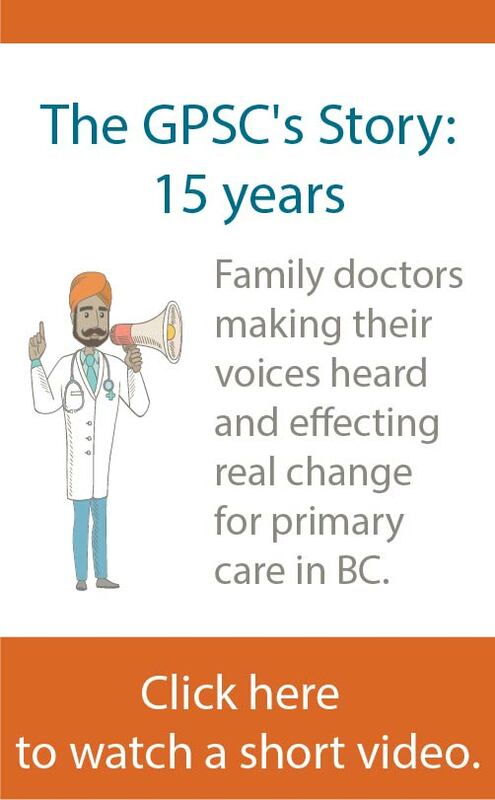 Division of family practice physician representatives (one each from the five health regions) will represent the voice of divisions within their region and across the province. Be involved in clinical practice in their community, as well as their local division. Have interest in contributing to provincial primary and community care discussions, particularly related to PMHs and PCNs. Be selected by a selection team comprising the GPSC co-chairs or designate (Dr Shelley Ross/Ted Patterson), two physician members of the GPSC, and two non-GPSC physicians*. * Non-GPSC physicians who participate on the selection team are ineligible to be division representatives on the PCCPIC. The GPSC is committed to ensuring that physicians and divisions are well supported with tools and resources to enable commitments and participation in this work.